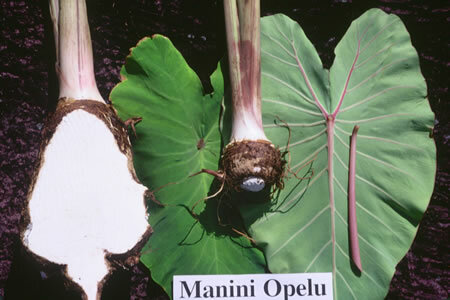 General Characteristics: Medium in height, well spreading, maturing within 9 to 12 months, producing from 5 to 10 oha; distinguished by profuse light and dark green striping of the petiole, with reddish tinge on upper third. Petiole: 65 to 90 cm. long, distinctly and profusely dark and light greenstriped, strongly tinged with reddish-purple on upper third, white at base, light pinkish at edge, curved slightly at apex. Leaf blade: 45 to 55 cm. long, 30 to 40 cm. wide, 40 to 45 cm. from tip to base of sinus, sagittate, thin in texture, drooping, inconspicuously light and dark green-mottled; margins undulate; piko purple; veins reddish-purple on lower surface; lobes acute with narrow sinus. Corm: Flesh white with yellow fibers; skin white to cream-colored. Inflorescence: Peduncle green-and white-striped with diffusion of reddish-purple; spathe 28 to 32 cm. long, the lower tubular portion 4 to 5 cm. long, tightly convolute, green-and white-striped with conspicuous diffusion of reddish-purple often nearly obscuring the striping, the upper portion tightly rolled, slightly open near constriction upon maturity, yellow, often drooping. Origin, and derivation of name: Native variety, the first part of the name is derived from the striping, and the second may be due to the coloring of the petiole or to the use of the corm as fish bait. Distribution: Planted in a few scattered localities, nearly always under upland culture. Use: Primarily as a table taro.